Some say that the ‘if’ portion of the debate over whether or not to pay college athletes is now over, and ‘if’ has been replaced by ‘when’. If that’s the case, when it’s decided that universities should pay them as university employees, will it ever work out to the student-athlete’s benefit? That’s simple. When they receive the money that will be the benefit. Whenever someone tells me such a simple truth my mind immediately goes to the unintended consequences the define the complexities involved. To listen to the sports media on this topic, it is, in fact, this simple. Right now, athletes are doing most of the work, and coaches, athletic directors, college chancellors, and all of the other salaried members of universities are benefiting from their labor. They’re getting rich off these poor kids. It’s high time the student-athlete got their piece of the pie. As with any argument, of this nature, there are numerous pros and cons, and the premise of the argument can be switched innumerable ways to favor one’s argument over another. These arguments usually contain the one plus one equals two scenarios. Big Ten gets paid, Northwestern gets a chunk of that, and that should start working its way down to the athletes, as opposed to antiquated idea of simply offering scholarships that leave football players playing for almost nothing. Anytime one hears one plus one arguments, they should immediately begin looking for the unintended consequences. One argument proponents make, regards the number of hours an athlete must devote to honing his skills. This dedication, they argue, can be so time-consuming that many athletes find it impossible to dedicate themselves to any equally time consuming pursuits, that can, in most cases, provide a more financially rewarding post-college career. This dilemma might cause most of student-athletes to pursue basket weaving-type degrees that are less demanding and less time-consuming. The solution, say proponents, and the current, symbolic figurehead of the movement Northwestern (NU) University’s former quarterback (QB) Kane Coulter, is to unionize. On March 26, 2014, Kane Coulter symbolically led Northwestern football players to successfully petition the Chicago office of the National Labor Relations Board (NLRB) for unionization, and to have them recognize scholarship athletes as university employees. Some have argued that even though this petition was not expressly interested in getting NU football players paid, in the short-term, it was a huge step in that direction. Northwestern said it would file a request for a federal five member NLRB in Washington to review the decision. It has until tomorrow, April 9, to do so. That decision could take months, and the final decision, likely to be made by the nine members of the Supreme Court could take even longer. To precede Coulter’s petition, members of Northwestern’s football team had a chance to sign union cards back in January, some players signed their names, others did not. Northwestern running back Venric Mark said that he wondered if the ones who did (sign the union card) realized the ramifications of the decision and where it would lead. This particular signing appears to have been an allegiance signing. It was an “Are you with us, or are you against us” signing with no apparent legal, contractual entanglements. The next signing, the April 25th signing to have Ramogi Huma’s College Athlete’s Players Association (CAPA) represent NU football players as a union, is legally binding, and those “that may not know when they’re getting into” the first time, may want to thoroughly research this contract before signing. One has to imagine that between now and April 25th, the founder and president of the CAPA, Ramogi Huma, will be holding a number of closed-door sessions with Northwestern football players, and we can guess that those particular discussions will not be focusing a lot of time on the law of unintended consequences. One has to imagine that bottom line economics will not be thoroughly covered by Ramogi Huma either. The university will, likely, require that one of their representatives deliver such a discussion, but anyone that has sat through university presentations can probably guess that it will pale in comparison to the pitch a Mr. Huma will deliver. Right now, Huma might say in his pitch, you have no one looking out for you, your health, or your brain trauma. The college chancellor doesn’t care what happens to you, is something else he might say, except in how it affects his bottom line. He may then start up a slide show that displays the statistics of football players that eventually succumb to something called chronic traumatic encephalopathy, otherwise known as CTE, and how no college chancellor, or board of regents, stepped in with immediate concerns of health. Huma may then show slides of former scholarship athletes like Junior Seau, Dave Duerson, and others former football players suspected of dying, and living a dramatically altered life as a result of this repeated trauma. Huma will likely focus his association’s greater concerns for the players, as individuals, than they are likely to receive from anyone at the university. He will likely do so, because it is in his association’s best interests, and it will divert the attention away from any whispers of unintended consequences. Some have suggested that this progression to pay private school, scholarship football players, and eventually all scholarship student-athletes, appears to have an end game in mind that seeks to change the title of the allotment of money an NU may provide to a future Kane Coulter from scholarship to salary. For four years, NU provided Coulter a food stipend, a living expense, and various other financial allotments that are allowed under the current rules of the NCAA, that some have suggested could total $250,000 a year. One has to imagine that even the best union leader, or agent, would have a difficult time attaining $250,000 from the most independent arbiter. They are more likely to settle for a sum of $65,000, or the amount of the scholarship for tuition. That football player that then receives that allotment, termed salary, would still have to that tuition if they hoped to maintain eligibility, or they could rack up the student loan debt that most non-scholarship athletes do. Regardless, say the proponents of this movement, this is a good move, because the football players would feel a certain degree of pride of earning a salary. Plus, it’s the right thing to do, they argue, for it’s about time that they see financial rewards for their efforts. The wrong people are getting rich out there. Though we need to make clear that Ramogi is not currently speaking of getting NU football players paid at this time, one has to think that he believes he’s taken a giant step in that direction. If he is able to accomplish that, and he is unable to convince the Internal Revenue Service that these athletic salaries should maintain the tax-free designation currently applied to scholarships, his eventual union members are probably looking at an estimated total of $22,000 in total taxes on the $65,000 scholarship-turned-salary they will make on an annual basis, according to Michael Bargo Jr.
Another foreseeable, unintended consequence that hasn’t discussed by the media –currently carrying Coulter on their proverbial shoulders— is healthcare. Football players currently enjoy free healthcare that is provided by the college’s medical school. If these football players are eventually allowed to become employees, they may not be covered by their parent’s plans, and they may end up on some Obamacare exchange, paying the premium a young person has to pay for the health services of the old and infirmed. The last foreseeable, unintended consequence that the scholarship athletes on NU’s football team may experience, soon after they vote to have Ramogi’s CAPA represent them, is yet another percentage of the probable, and ever-dwindling, $65,000 pie, that they will be required to pay union dues. The average, U.S. union due is roughly between 1.3% to 5% of earnings. If Ramogi’s CAPA charges the average rate of most unions, the unionized member of the NU football team, would be required to pay anywhere from $845.00 to $3,250 in dues. This may not seem like much when compared to the $65,000 that Ramogi’s association may eventually secure for these football players, until one adds up the $65,000 the scholarship used to pay for tuition, the healthcare, and the $22,000 in estimated taxes, until Bargo Jr. estimates, they could end up paying out approximately 100,000 for the privilege of playing on Northwestern’s football team, and attending the school, for one year . One has to assume that Ramogi won’t make this, or any of the other unintended consequences a part of his closed-door union presentation to these NU’s scholarship athletes, or if he is somehow required to properly inform them of some of these consequences, that he won’t make it a prominent feature. One can assume that by the time Ramogi is done with these scholarship athletes that he’ll probably play on their desire to eventually achieve financial freedom so well that they’ll be signing his contracts with dollar signs dancing in their heads, but those players will hopefully realize that Ramogi may also have the same dollar signs dancing in his head, which will be the same dollar, or a percentage thereof. 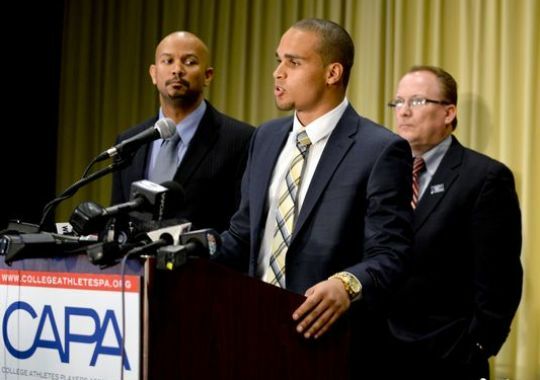 Having said all that, we also have to consider the idea that CAPA president Ramogi Huma is a former scholarship athlete, playing linebacker at UCLA, and this gives him some insight into the plight of the modern day scholarship athlete. He has also been an advocate for this cause for some time, so his efforts may be entirely altruistic. We must consider that he may be devoted to helping scholarship athletes see the reality of their value. Even if his goals are noble, however, and more and more student-athletes begin to move towards the road he paves for NU athletes eventually being paid, a road many believe to be inevitable, will the union leaders, agents, and other assorted representatives that follow Huma be as noble, or will the college athletes of tomorrow see the future of college athletics in the light Bargo Jr. portrays? Will Kain Coulter, and his former Northwestern teammates, be regarded as pioneers in a movement that managed to unshackle itself from an archaic system that enslaved student athletes to a system that enriched the very few “masters” in the upper echelons of universities, or will they be seen as fools that simply changed their “masters” and dug themselves into a financial hole so deep that they now curse those that told them that the path to financial glory was paved with their good intentions?